In this second chapter of Cobra Command, Snake Eyes #9 follows the title character and his team as they infiltrate deep into Cobra territory. Meanwhile, Storm Shadow becomes aware of Snake Eye's presence. The Joes strike back in this issue as Flint's team coordinates Thai offensives against Cobra forces. The main action, however, follows Snake Eyes, Helix, Iceberg, and Alpine as they try to bring down a major Cobra weapons depot. While this issue had less of the shock-and-awe of the last chapter, there were smaller plot points being addressed (the reactions of the neighboring countries, and intelligence sifting by the Joes) that helps flesh out the story. While I would normally be glad to see Alpine and Iceberg being given more attention, I have to wonder what those two are doing running around with Helix and Snake Eyes in Southeast Asia. Dixon even makes a point of having Iceberg ask that same question, but no answer is given. Overuse of these three supporting characters has a potential of becoming stale, which is completely unnecessary considering the vast pool Dixon can (and should) draw from. As with the last chapter, the reader is being teased with foreshadowing of an upcoming meeting between Snake Eyes and Storm Shadow. It would be nice to give Storm Shadow bit more "screen time" in preparation for this showdown, and not just the final page of each of these books. 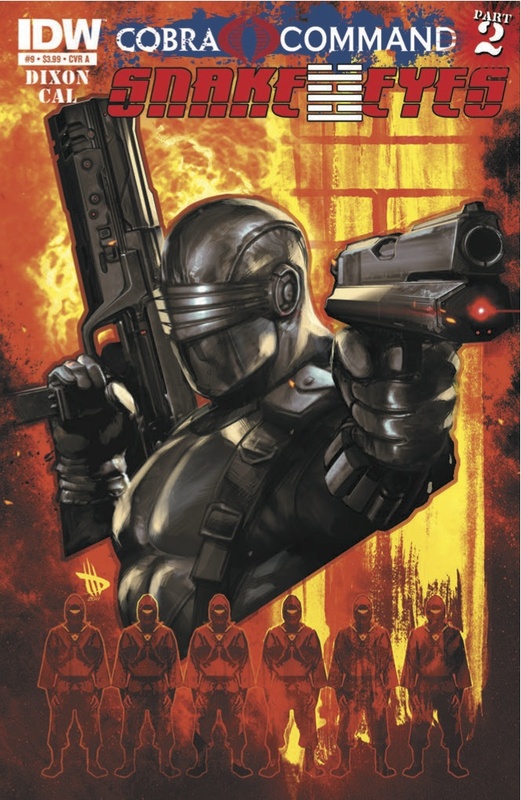 Alex Cal has a good eye for dynamic art, making the action scenes with Snake Eyes easy to follow (critical for a book with a silent main character). Cal's strength, though, seems to be vehicles, giving them the attention they deserve. He was an excellent choice for a Cobra invasion-heavy storyline. It was great to see Robert Atkins drawing Joes once again, even if it was just for a cover. A strong second chapter to the Cobra Command event. Recommended.